The Canadian-born scholar discusses the origins of Polish national identity, its tight relation with Catholic religion and the concept of national sensorium. Culture.pl: For Poles much of the historical significance associated with the Baptism of the first Polish ruler Mieszko in 966 lies in the fact that from this moment onwards Poland became part of Western Latin civilization. The Baptism is also seen as the founding event of Polish history establishing a link between the Polish state (and nation) and the role of Christianity. How does this historical reality of the Baptism look from your perspective as a historical sociologist (and maybe a foreigner too)? Geneviève Zubrzycki: First of all there are a lot of countries where the 'beginning of history' starts with the conversion of the king into Christianity. It's a convenient historical marker to begin the narration of a specific state’s history. Poland is therefore not unique here. But what I think is interesting, and most relevant today, is that the construction of Polish national identity, in the second half of the 19th century, for many reasons becomesassociated with Catholicism. Because of that, the conversion of Mieszko I to Christianity becomes a key element in the modern national narrative. Is the beginning of the state also the beginning of the nation and national identity? Before the 19th century you can't talk about national identity per se. These are terms that we anachronistically project into the past. When Mieszko converted, it meant little for the population and how they lived their lives. But it did, in time, bring Poland into the orbit of what we refer to 'Western civilization,' via Western Christianity. To my mind what's more significant is what happens at the moment when modern Polish national identity was constructed in late 19th century; when national identity and Christianity, and more specifically Catholicism, become tightly connected. What happens with Polish national identity before 19th century, throughout history? That also depends on what you mean by history. In the 16th century you cannot talk about Polish national identity the way we understand that term now. Most scholars of national identity and nationalism argue – and that's the new orthodoxy in the field – that national identity is a specifically modern phenomenon. Before the late 19th and beginning of the 20th century, even in the old states like France, the majority of the population of places like France, Italy or Poland didn't have a national identity per se – people had regional or local identities, or embraced a supranational identity like Christianity. When did Polish national identity start taking shape? With the partitions of Poland this germinal notion of a civic national identity is no longer possible because there is no state through which to elaborate, develop and expand that national identity to other social classes. Without a state, a new notion of the nation is articulated by Romantics, who imagine the nation not as a set of rights and duties related to political institions, but as a way of 'thinking' and 'feeling' the nation. The nation becomes this abstract “soul,” while the state is a mere body. While the state is certainly important and worth fighting for, it is the soul that matters most.. It is at that moment that historians like my colleague Brian Porter-Szucs, argue that Polish national identity is at its most inclusive: that notion of identity can be extended to social classes beyond the szlachta but is not (yet) restricted by ethnonationality and religion. As the nation at that point is understood as a spiritual principle, 'Poles of the Mosaic faith' who fought for Poland were members of the nation. The nation becomes reconfigured 'sociologically'. It becomes associated with objective markers of a large segment of Poland’s population, namely ethnicity and religion; Polish language and Catholicism more specifically. This process is facilitated by policies like the Kulturkampf, which specifically targeted Catholic institutions and practices . Reactions against and resistance to these policies practically helped linking Polish national identity with Catholicism. At the same time, the metaphors used in Romantic poetry to express abstract notions of the nation as a soul, like that of Poland as the Christ of Nations, were transmitted to the masses through images and rituals. The masses were not literate in the 19th century and could not read those complex texts, but they might hear a poem or see scenes of a play performed; poetic metaphors, of Jesus as Christ of nations, for example, were illustrated on postcards, newspapers and such popular materials, ultimately creating a national culture that looks, sounds and feels like Catholic objects, hymns and practices. Think of groby pańskie (Holy Sepulchres), when one prays for the resurrection of Jesus/Poland at Easter. And because Poland didn't have a state for so long, that culture is extremely well developed – in rituals, in songs, in theatre, in the canon of what children learn in school, but also in the landscape, in monuments, in practices such as leaving flowers by plaques for martyrs of the nation that dot the urban landscape of Warsaw and elsewhere. Popular postcard published circa 1891: 'The postcard commemorates major events in the life of the nation. In the background, Cracow’s Wawel castle (the panorama was sometimes changed to a view of Warsaw). A cloth draped around the cross bears the inscription "The Time of Redemption has not yet Come.” Poland is represented as both Jesus and his mother. The dates on Jesus’ staff are of the Partitions (1772, 1793, 1795) and on the cross’s beam of the Centennial of the Constitution of May Third (1791-1891); hence Jesus represents the union of the nation and the state, crucified (repeatedly partitioned) but certain to rise again. The pages ripped from the nation’s bible, appearing against the background of Mary’s cloak, mark key (failed) national uprisings. The Virgin appears to represent the nation mourning the loss of statehood; though presently in chains, she will one day be “free,” i.e. regain independence.' Source of text: Geneviève Zubrzycki, History and the National Sensorium: Making Sense of Polish Mythology. Reproduced from Kłoczowski (1991), with permission of Editions Spotkania. These specific practices arose from the metaphors used by Romantic poets like Mickiewicz and Słowacki, but became embodied in material practices and symbols. It’s important to note that the Roman Catholic Church found those metaphors very problematic, heretical even. But once created, it entered the “canon” of national culture, and because that national culture was partly articulated around Christian iconography, it became possible for the Catholic Church to claim that it had always been on the side of the nation. (Even though the Church hierarchy did not support national insurrections, following Rome’s line). What is important to stress is that those Romantic, messianic metaphors materialized in folkloric, religious and political practices, slowly creating what I call the national sensorium. The 'national sensorium' is the visual depiction and embodiment—in cultural forms, the built environment and the landscape—of historical narratives and national myths that are experienced by individuals in a variety of practices and settings. In my previous work, I have shown how in Poland religious metaphors, practices and rituals rendered the abstract idea of the nation concrete in the context of statelessness. As social actors sensorially experience national narratives and myths, for example, by wearing religio-patriotic jewelry; carrying a cross at a political demonstration; kneeling before the sacred icon of Our Lady of Czestochowa and holding its profane reproduction, abstract and distant political ideas become concrete and close, often acquiring political traction. 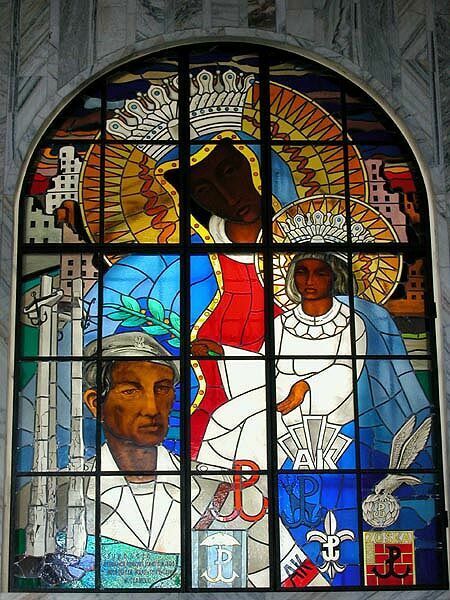 Stained-glass window with Our Lady of the Home Army at Jasna Góra’s Chapel of National Memory. 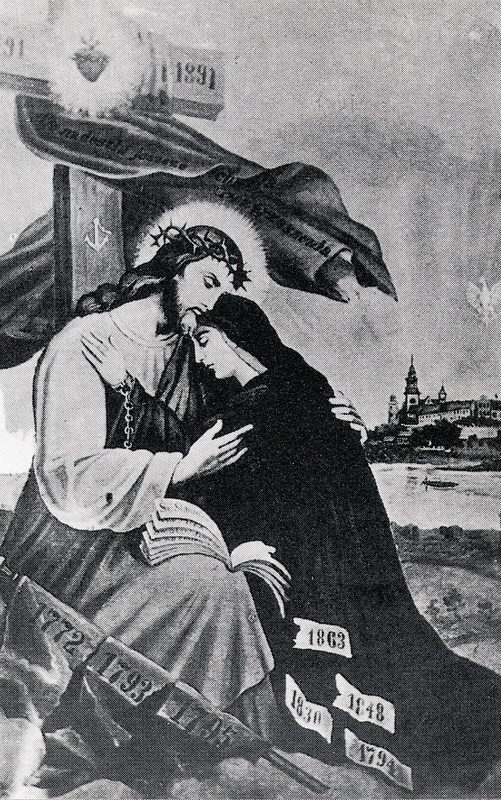 A World War II variation on the traditional Black Madonna of Częstochowa, the Virgin has her head tilted in grief and exhaustion, the ruins of the city after the Warsaw Uprising surrounding her. Notice, on the left, three large crosses, a monument erected in 1980 to commemorate the death of protesting workers, killed a decade earlier by the militia in Gdańsk. Throughout, symbols of Polish resistance (“PW”- Polska Walcząca). Source: Digital photograph provided by and reproduced with permission of the Jasna Góra Sanctuary, Częstochowa. In my work I argue that the national sensorium, which is very strong in Poland and present in everyday life, makes Polish national identity and its narrative of the Polak-Katolik, very difficult to dislodge Simply,the public sphere is pregnant with these images to the extent that Polish people might not even notice them. But it still shapes their consciousness. Did regaining independence change anything in this process? In the interwar period there was a lot of debate about what the shape of the state should be. Should Poland follow Piłsudski’s vision of a multicultural polity or Dmowski’s vision of an ethno-Catholic nation? Note that Piłsudski’s vision was not quite the idealized mosaic of multiculturalism, but rather a society in which Poles were considerered the core of the nation, with minorities being tolerated. It was a hierarchical multicultural Poland, with ethnic Poles at the top. Are the ideas of Jagiellonian and Piast Poland good analogies when speaking of Piłsudski's and Dmowski's visions of Poland? Jagiellonian and Piast Poland can be seen as 'models' for these two visions of nation, or – points de repère. In a way it doesn't matter if they are historically correct or not; they become symbols... For example, the Communist party-state tried to boost its legitimacy by arguing it had recreated the original Piast Poland, articulating its propaganda around the so-called Recovered Lands. Did all these processes of shaping national identity happen in Poland later than in other European countries? No. In his book Peasants into Frenchmen, Eugen Weber argues that the process of making French nationals occured between 1870-1914. National identity, even though we like to think of it as ancient or even primordial, is actually a very recent development, even in places like France – which had a strong centralized state early on. The creation of Frenchness was achieved through mandatory primary education that eradicated local dialects and taught the French language to children, the history of the country and its geography; railroads which facilitated communication between difference regions of France; and the army, where the common language was French and a strong esprit de corps and feeling of national belonging could be fostered. Most French citizens did not speak French until the turn of the century; they spoke regional dialects. France is far from being unique; most European societies were in a similar situation. We may think that in the 17th century there was something like Polishness, but this is not historically accurate—or, at least, how Polishness or membership to the Polish nation was defined then was very different to how it is now. Is this Polish national identity, defined by ethnicity and religion, typical for the region? Most of Eastern Europe, along with Germany, follows a model of nationhood in which national identity is understood in ethnic terms. National identity is thought to be carried though ancestry (blood line) and culture. In Poland, ethnonationality and religion are linked. But other nations also equate ethnonationality with religion; think of Russia and Ireland, for example. Hungary is associated more broadly with Christianity, since its population is primarily Protestant and Catholic. In France, the US or Canada, national identity is understood in political terms: what makes you a national of your country is your acceptance of the tenets of the social contract. So you're French because you subscribe to a set of political principles, regardless of your skin color, religious affiliations, and such – at least in theory. We know, of course, that ethnicity and race also play a role in defining national identities in those societies, but the guiding principle behind national identity is more political than ethnic... So France and Poland are very different in the way they theoretically define members of their community. Your most recent book deals with national identity in Quebec, which historically has also had a Catholic population. Is the case of Quebec in a way similar to Poland? Quebec shares very important traits with Poland. While Canada was first “discovered” and colonized by the French, the colony was lost and ceded to England in 1764 in the Treaty of Paris– then you have a new colonial power that settles in. A new colonial power settles in, and resistance to it, over time, is primarily structured around language and religion. The French population being Catholic, the Church becomes a crypto state. In Quebec, until the 1960s’ Quiet Revolution, to be French Canadian was to be Catholic. Interestingly, the French Canadians in the 1830s and 1860s were closely following what was going on in Poland. They understood the situations of Poles and the Irish as similar to their own, being oppressed by colonial powers.Similarly to Poland, with a lot of people hung and deported. And after that there's no elites to carry a liberal republican torch, that's when the Catholic Church comes and really becomes a powerful institution that starts to manage all spheres of social life and that's the model basically from the 1840s until 1960s – for over a century of ultramontanism. In the 1960s there's an anti-colonial movement that is also inspired by what is going on in the US, in Vietnam, in other French colonies. That's when French Canadians in Quebec rebel against the Church, which they see as an oppressor, just like the English or the Federal Government of Canada. A new national movement argues that that the Quebecois must rid themselves of colonial and hegemonic institutions: the Crown, the Church, and US businesses that own much of the national resources of the province, And that's what's called 'The Quiet Revolution' which basically is a process of the secularization of society and of national identity, when French Canadians in Quebec redefine their identity around language and territory (and start calling themselves Quebecois) and a new political elite create the modern welfare state. In the preface to your book The Crosses of Auschwitz you recall how upon coming to Poland for the first time you were shocked to see this mixture of patriotic and religious feelings, the two strands being inextricable and inseparable. One reason could be that the Church in Quebec came to be seen as having shared power with the English and had exercised too much social control. The church, until 1960, controlled education, health and welfare.It made sure that business was perceived as dirty and best left to Protestants and Jews; that Catholics were better suited to cultivate the spirit and the land. As a result, the French Canadian population was less educated and much poorer that English speakers. The Quiet Revolution was a time of rebellion against an institution that controlled everything; it was a movement of emancipation from the Church and the English. This also coincides with the sexual and feminist revolutions, with all anti-colonial in the world – so all this context, this special conjecture possible the secularization of national identity and of society. In Poland, the Church did not control everything and did not come to be seen as having collaborated with colonial powers. Another reason why the ethno-Catholic national narrative remains powerful is that it has that strong sensorium I talked about. Think about it: Solidarity was a very progressive civic movement. Yet all the iconography and the rituals they used were from the Romantic period: masses, protests at churches, singing hyms, walking with the cross. National Romantic iconography. So Polishness is still, to a significant extent, 25 years after the fall of communism, associated with Catholicism. People are socialized into a national culture not only intellectually, through institutions but through the senses; it's about the smell of incense you smelled in church since the time you were three years old, and the stories you heard at home, and the monuments you cross on your way to school or work. This means that this Polish nationalism is in a way inscribed or encoded in our bodies. Is that the idea of sensorium? Yes. The fact that you're walking in the street and see places ruined or a plaque which says 'Here X Poles were killed by the Nazis on Y day.' It's something that is sensorially ingested, consumed by individuals, and that's part of their being. So this nationalization is not just an intellectual thing - it's a phenomenological process. And if there isn't an alternative way of presenting and experiencing a nation, then it becomes difficult to define an alternative national identity. This is not to say, however, that people are uncritical of that vision of national identity or that there are not significant attempts to redefine Polishess; There is, and I have written quite a bit about it. Does Quebec also have a sensorium similar to the Polish one? Quebec does not have a strong national mythology nor a developed sensorium. The pre-1960’s French Canadian identity was articulated around Catholicism, but the sensorium itself was weak and was mostly evacuated with the redefinition of national identity around a secular Quebec. How do you define your national identity? I'm Quebecoise. My identity is built around language. Though I also feel more Canadian since I’ve emigrated to the United States 20 years ago. The fact that the US is much more conservative than Canada and that the Right is very strong here at the moment makes me appreciate Canada’s liberal public policies and welfare state more than ever. Geneviève Zubrzycki – Canadian-born scholar, Associate Professor of Sociology at the University of Michigan. Her research has focused on national identity and religion, collective memory, and political transformations. She is the author of The Crosses of Auschwitz: Nationalism and Religion in Post-Communist Poland. Her most recent book is Beheading the Saint: National Identity, Religion and Secularism in Quebec, a monograph on the genesis and transformation of French Canadian/Québécois national identity from the mid-nineteenth century to the present. Her latest research project focuses on symbolic boundary-making in Poland through a study of the Jewish revival in Poland and the interest of non-Jewish Poles in all things Jewish.. The Solidarity Movement: Anti-Communist, Or Most Communist Thing Ever?